Saya will do her shiba 500 after a hour or two hour walk lol I guess that wasn't long enough of a walk.. She only does that during winter and cool weather never in summer and hot days. Saya much more hyper in winter her favorite season. Saya loves to dig into fleece blankets or fleece sweaters she'll then do the shiba 500. She also will do it when I'm playing with her and she gets excited. same as the OP after going to the bathroom or coming home after a long time. Bootz does it randomly. But she gives off a few barks as a warning, also as a way to say "lets play!" then shiba 500s. I think its her way of releasing energy, it happens more often when the weather is wet and I can't take her to the park. Jackie does her Jackie 500 randomly too. It happens less frequently than Bootz' shiba 500, but its so adorable seeing a little 5 lb black dog running around the room. You'd think she's a rodent. LOL. It seems to be triggered by the time of day, specifically around 9pm. It doesn't matter if we've been playing all afternoon, taken long walks, etc. She'll start by faux digging in her bed and then she's off to the races. When she was a little smaller she had a full circuit she would run out of the master bedroom, into my daughters room, around her chair, back into the master, dive/slide across the hardwood under the bed, out the other side and repeat. Fortunately she doesn't fit under the bed anymore. Also giving Saya a bath triggers it once she is done getting dried off she'll go after the towel dig into it and bite it and then run like crazy. After a good long walk. I haven't taken him on a walk that wears him out yet, and we've taken some long walks! He just LOVES getting out of this harness, and for the time being, we don't have a yard he can run loose in. So he does the 500 in the 500 sq ft fenced in yard we have! Also, when I get home and go out to play, the first thing he does is a 500 run. Then we play fetch or do some training. or both. Tiger Lily is very random. We can usually see the gleam in her eyes a minute or so before it starts. Sometimes she can be encouraged into doing it by taps on the floor. She will sometimes do a 500 around the back yard if she doesn't want to come in. In that case, all you need to do is crouch as if you want to pick her up, and she will zoom around, kicking up dirt. Ari has only been home about a week, so we haven't seen him do it yet. I don't remember how old Tiger Lily was when she did her first one, but we are interested to see if he is as fast as she is... and if they will do it together! My two do it as soon as they see one of us for the first time in the morning, every time they go in the backyard,if they hear of the neighbours dogs barking, if my cat is sprinting around and climbing up the screen doors,if kids come around or if you want them to come inside and they are not ready. They have so much energy, although they do less of them throughout the day when we take them for their big run/walk. @saya I definitely forgot about after baths he seems to understand air dry very well! Bruce just tends to do it at certain times of day. In the morning when we wake up, and in the evening when we're "trying" to wind down. A good long walk, a bath, or a good poop will send my dogs into the Shiba 500/zoomies. i propose we make a video thread of shiba 500s!!! Ponta goes nuts both during and after walks. During a walk, it is after he poops, and may be because he was denied freedom to do something or go somewhere. Usually it is in a field or open area, and not (thankfully!) a road. We don't have any videos of him recently, but here are a couple of when he was a puppy. The first one is raw video of him in a restricted space--his pen--and the second one is more fun, with nice edits and what I think is fully appropriate background music. Elwood does it after walks & before bedtime. As soon as I lay down in bed at night I can be guaranteed that Elwood will do a quick Shiba 500, grab a toy, and plop it down on my face. After he realizes that I'm not going to play, he curls up next to me & goes to sleep. Sakura is triggered by baths, morning poo, and right before bedtime. Her 'speciality' is leaping between our two couches. Hiro will do that after walking in the rain. He gets crazy! Here's a video of him doing the 500. The Shiba 500 trigger for Apollo seems to be after we clean up the dinner table? Or after he gets really excited from a play session. They always happen in the evening though. He just found his favourite pink ball that had been stuck under the sofa for the last couple days and went crazy. 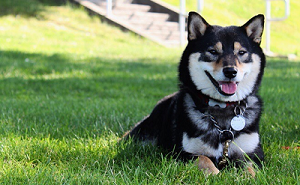 Kinako will do the Shiba 500 after he comes into the house from a car ride. If you get him worked up while playing he'll run around the living room then jump on the couch and start digging like crazy. Also, his tail is constantly curled up except for when he sleeping and when he's doing the Shiba 500. Bailey goes for a Shiba 500 after a good poop....he just goes non stop when we get in the house. Also playing fetch can trigger one. Before playing, during playing, after playing. After getting wet, if another dog initiates play, after digging, if I leap and stomp loudly in front of him, if I tell him to, whenever he wants. Hinoki used to do the zoomies all the time when he was a baby. Nowadays, he generally only zooms around when his best friend comes over to our house to play. He is so happy that he just goes insane running around the house! Zim gets the zoomies sometimes when someone is playing with him. He'll get so excited about fetching something (or whatever) that he'll just zoom right past (sometimes half picking it up over and over again) and start doing circles around the coffee table---or a circuit of the room that has him jumping up and running across the couch. It's hilarious. There is a section in Kiba's play area that I block, every time he climbs over and I catch him and pick him up to redirect he bites at my hands. The moment I put him on the ground the 500 begins. It's pretty annoying when he bites at my hand though, I don't mind him doing the 500, but is there a way to stop him from nipping/biting my hand. He's been desperately trying to get back into that area. Guts does the shiba 500 when Gidget provokes him. Gidget hides under the table outside inbetween all the chairs. She barks at guts from under the table and fights him off so that he can't get under the table. So Guts gets frustrated and runs around the table over and over, while gidget just barks at him. They do this every day! Bootz and Jackie use to do the 500s around 11:30 pm just before bed. But lately i've noticed Bootz hasn't been doing 500s at all. Does the frequency of shiba 500s usually die down with age? I assume its normal because she's very mellow and not active. Although she is fit and in good health. Since adding Tanjiro into the mix I have found that Bear now believes the sectional is just another agility obstacle like some strange jump. If Tanjiro is running laps around the sectional Bear has no issue jumping onto the coffee table, onto the couch, onto the back of the couch, and then down to the floor off the back side to cut Tanjiro off. Kobe seems to do this after his last walk at night. Knows he's going to bed but has to get rid of that last bit of energy!! after walks he'll do the shiba 500s sometimes. Also when we catch him doing bad things he'll go nuts... like if he's in the backyard and he starts digging and we yell or knock on the window and startle him, he totally knows he wasn't supposed to do that so he starts zooming around everywhere.. it's really funny! Jax usually does the shiba 500 after coming in from outside or when he's trying to get us to chase him around the living room. He used to do it a lot more when we lived in our apartment because he could run a figure 8 track around the furniture. At our new house he has a long hall way and just the coffee table to run around so I guess its not as much fun lol! When I come home from work and let Keiko out of her crate, she has to do the Shiba 500 for a few minutes before she'll let me put her harness on to take her out (I know she has to pee, but apparently she has to get the zoomies out of her system first!). She also does it after we come in from our walk and I take the harness off. Although for Keiko, she runs at about 1/2 speed. So more the Shiba 250. The problem with the Shiba 500 in my house is with two dogs now, one getting close to 40lbs, they use the living room sectional as a way to bank turn 90 degrees. They launch onto it which sends it backwards into our big glass living room sliding doors and bank around to the other side. Sometimes if my older boy is not in the race lead he actually at the turn will go up and over the sectional (I am chalking this up to allowing him to learn agility contacts). While very funny, we try to discourage it as we know it could lead to more window damage or sectional damage. When our dogs(3) do their version of Shiba 500, they go between the bedroom and living room. They usually go under the bed, then into the living room jumping on the couch and turning around back into the bedroom and onto the bed. Sometimes they will just circle on top of the bed. Hoshi is our youngest and he almost "flies" onto the couch. At times I don't like it when they play on the bed because it wears out the bed spread, that I make, but it is so fun to watch. My husband wanted me to add, it can be fun to watch until the moment they are racing around the Shiba 500 and head to the bedroom only to slide on the tile full speed into a large sliding glass door from our bedroom to the pool area shattering it at a cost of about $1,000 to replace the glass and put on new hurricane impact film ... Yes, that happened ... luckily in Florida we have hurricane impact film that prevented them from potentially going through the glass or it coming out of the frame after shattering. We feel blessed the dogs didn't get hurt, but it has caused us to discourage in house Shiba 500 races now and leave those races to the golf course play. OMG, I've had Keiko about 5 weeks now, and she now limits her Shiba 500 to "Mom came home from work". It's hilarious! She runs all over the house, attacks her toys, and displays a play stance for me. I've learned to feed her BEFORE her walks, or she drags out the door...I suspect she's figured out food comes after walks, and she'd rather have food. So, now we feed and walk. It's working much better. But yeah, mommy coming home from work freak-out (I call it kazoomies) is a given. It's totally cute. Bandit gets zoomies after coming back from a walk or when I have one of his "special" toys (these are toys that he only gets to play for 15-20 minutes at a time). He also does a toned down version of a Shiba 500 when he sees the Kong Wobbler. He'd run/hop in a circle until I put the wobbler down. Then he'll sit nicely until I give him the go ahead.